If you dream of la dolce vita, strolling along the canals of Venice, or summering in Positano, you’re not alone. Italy is a dream destination for many a traveler. But if jetting off to Italia isn’t in the cards for you, you can bring its cuisine and ambiance to you—no passport required! To set the mood, queue up your favorite playlist for your evening. Depending on your crowd, you may opt for a little Italian-American flair with hits by Dean Martin and Rosemary Clooney, classical opera by Puccini, or a more contemporary sound with Eros Ramazzotti or Lucio Battisti. This playlist on Spotify hits the spot. You’ll also want to set the table with proper linens and silverware, and consider adding seasonal flowers if space allows. If you’ll be dining outdoors, you may want to add candles to your table for when the sun goes down. 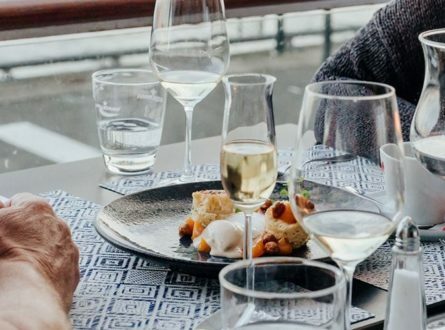 In the tradition of Northern Italy, aperitivo anytime between 4:00pm to 9:00pm is meant to serve as sort of a “happy hour” and a way to whet your appetite before dinner. 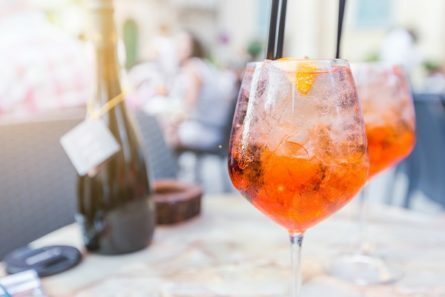 While wine is a popular option, you can also try a quintessential Italian drink like Campari or Aperol with a bit of soda, or with a splash of Prosecco (known as a spritz). Other popular beverages include vermouth, negroni, or a classic gin martini. Also note that aperitivo is meant to include salty appetizers. To get more insight on how to throw your best Italian-inspired dinner party, we caught up with Francesco Torre of Canetti Roadhouse in Forestville, CA. Torre, a native of Massa, Italy, is a former executive chef at the five-star Il Bottaccio Hotel in Tuscany and the Badia a Coltibuono winery in Chianti. Additionally, he enjoys hosting his own family-style dinners when at home. 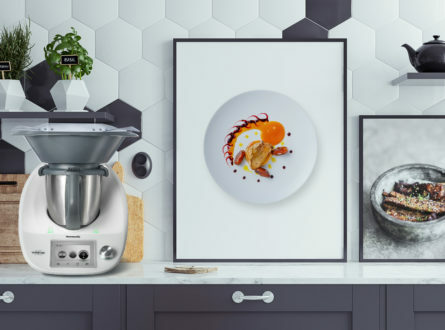 Taking Torre’s lead, we rounded up some Italian aperitivo bites and dishes from our Cookidoo® recipe platform. 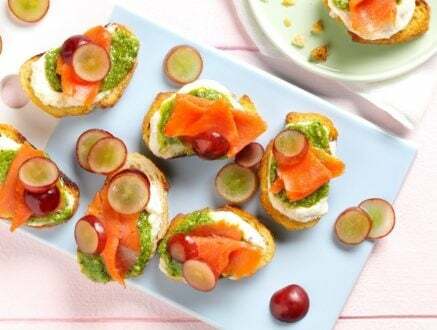 These little toasts are made with lemon ricotta, watercress pesto, and topped with a bit of salty, smoky salmon and fresh grapes—a perfect combination of savory and sweet. A red jalapeno pepper gives a little kick to this easy appetizer made with marinated artichoke hearts and cream cheese, whipped together for a creamy spread. A creamy blend of Gorgonzola and ricotta cheese make up the body of this luxurious dish, set atop a crust of cracker crumbs and topped with briny green olives. 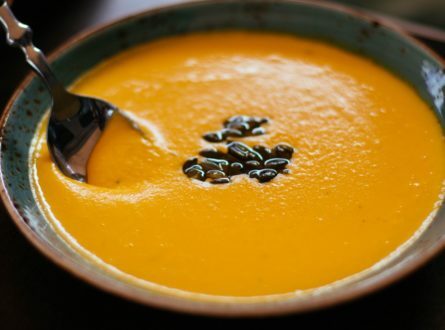 Formal Italian dinners consist of many courses, starting with antipasti, pasta (primi), meat (secondi), salad, soup, fruit and cheese, and dessert (dolce). This can all be a bit overwhelming for a more casual get together, so remember, you can always minimize. But if you want to go all out, here are some more tasty Italian plates. 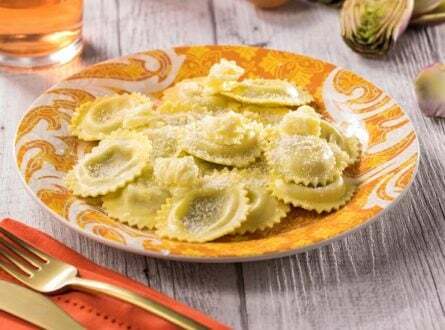 Follow up your appetizer course with these billowy ravioli. Tangy goat cheese plays well against the salt of the pancetta and artichoke, and your guests will be impressed that you put them together yourself! A classic Roman favorite, this simple dish only has a few ingredients so make sure you’re using the best quality eggs, bacon, and cheese you can get your hands on. If you prefer thicker pasta, go with a bucatini, and adjust the pasta cooking time accordingly. No need to stand over the stove stirring endlessly with this creamy, vegetarian-friendly risotto, featuring porcini mushrooms. Play around with the types of mushrooms used in this dish. Brown creminis will yield very mild flavor, while a mix of wild mushrooms like morels and chanterelles will be earthier and more robust. 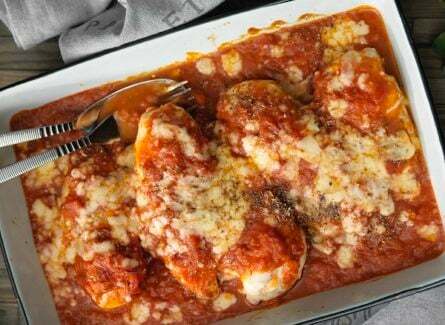 A perfect dish to please those who prefer poultry, this recipe tops steamed chicken breast with tomato sauce and cheese, akin to a healthier version of Chicken Parmigiana. Pork tenderloin is simmered in a spicy tomato sauce and herbs for a tantalizing, succulent main dish. Fire roasted tomatoes add depth and complexity. You can even repurpose leftovers as pasta sauce the next day. Contrary to popular belief, meatballs are rarely served with pasta in Italy. They’re often their own dish. This classic recipe uses all ground beef, but you can also change it up by adding ground pork or veal to the mix. 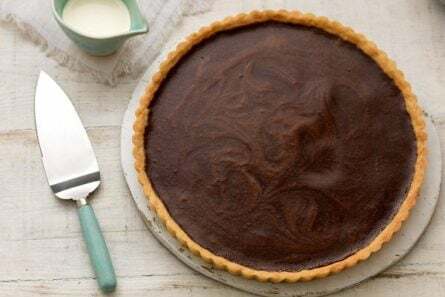 Just four ingredients make up the filling for this dark and delicious tart. The beautiful thing about this dessert is that it isn’t too sweet, and it pairs with espresso or port really well. Mascarpone cheese, strong brewed coffee, and ladyfinger cookies are layered together in this truly classic Italian dessert. Tiramisu means “pick me up” in Italian, and trust us, you won’t want to put it down after the first bite. Pistachios are ubiquitous in Italia, and you’ll find them everywhere from gelato to cannoli. Impress your guests by serving up your own homemade pistachio ice cream, and garnish with even more pistachios and a hint of shaved chocolate. If your guests won’t drink coffee at night, offer a digestif of Amari or Fernet Branca to help aid with digestion, limoncello or grappa. Take your time. A true Italian dinner can last for hours if the wine and conversation are flowing. When hosting dinner at home, if the evening goes well into the early morning, non fa niente. Dishes can wait until tomorrow. Want some more Italian inspiration? Check out our brand new Italian cookbook “Italian Kitchen” here!